What's happening over the horizon? Although the scene may appear somehow supernatural, nothing more unusual is occurring than a setting Sun and some well placed clouds. In this picture are anticrepuscular rays. To understand them, start by picturing common crepuscular rays that are seen any time that sunlight pours though scattered clouds. Now although sunlight indeed travels along straight lines, the projections of these lines onto the spherical sky are great circles. Therefore, the crepuscular rays from a setting (or rising) sun will appear to re-converge on the other side of the sky. At the anti-solar point 180 degrees around from the Sun, they are referred to as anticrepuscular rays. 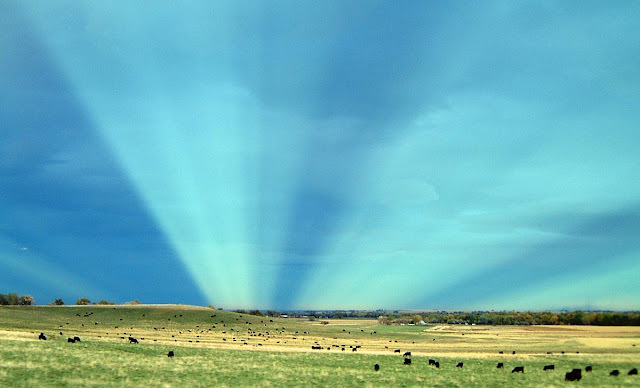 On this picture is a particularly striking set of anticrepuscular rays photographed in 2001 from a moving car just outside of Boulder, Colorado, USA. 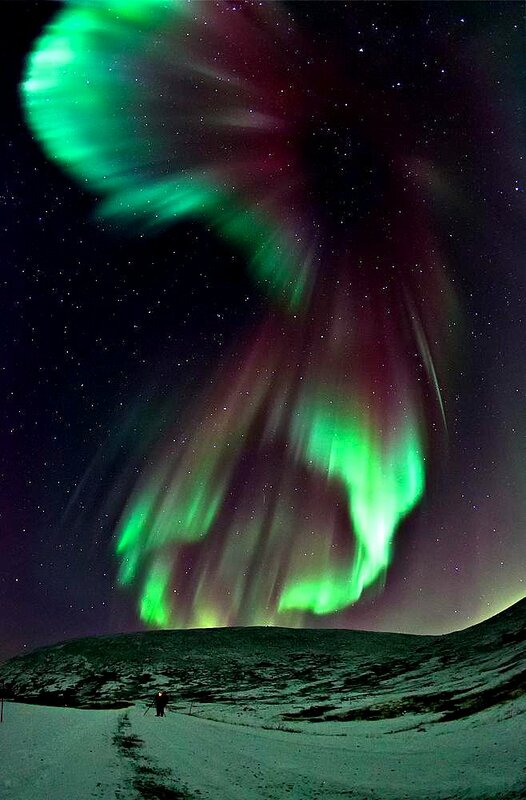 In 2011 it was one of the most memorable auroras of the season. There was green light, red light, and sometimes a mixture of the two. There were multiple rays, distinct curtains, and even an auroral corona. It took up so much of the sky. 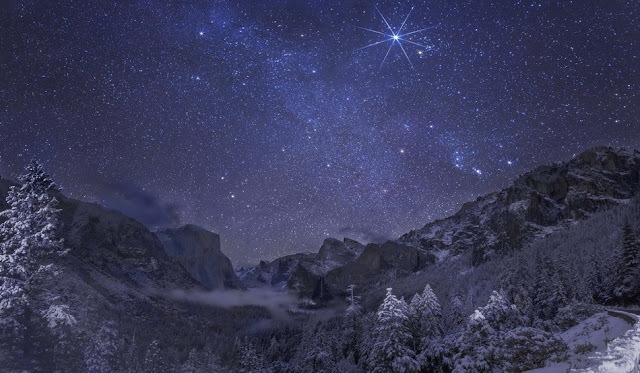 In the background were stars too numerous to count, in the foreground a friendtrying to image the same sight. The scene was captured with a fisheye lens around and above Tromsø, Norway, in November 2011. With the Sun becoming more active, this year might bring even more spectacular aurora. 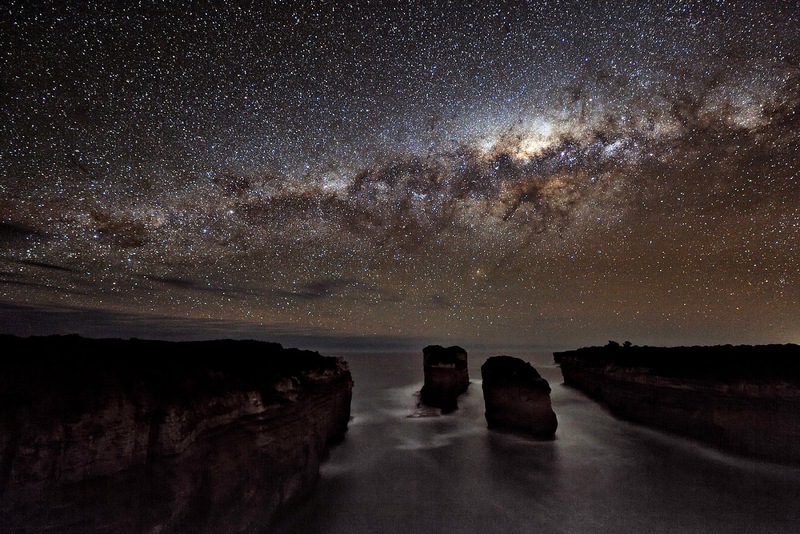 Have you ever seen the Milky Way's glow create shadows? To do so, conditions need to be just right. First and foremost, the sky must be relatively clear of clouds so that the long band of the Milky Way's central disk can be seen. The surroundings must be very near to completely dark, with no bright artificial lights visible anywhere. 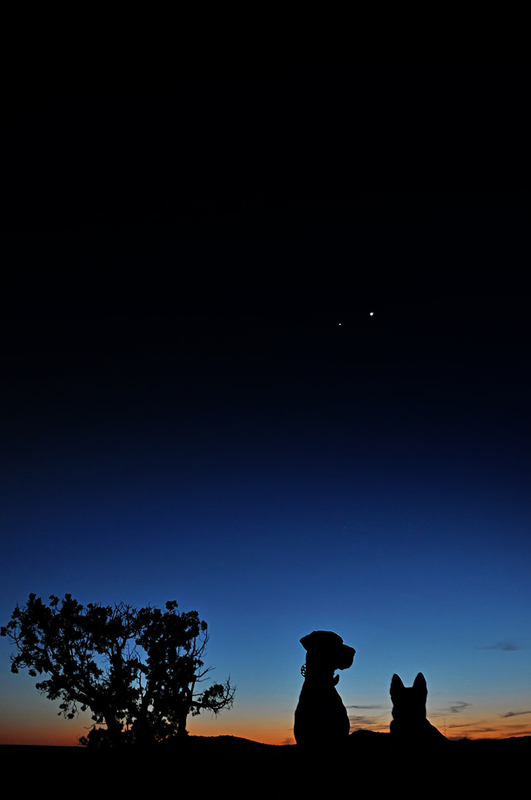 Next, the Moon cannot be anywhere above the horizon, or its glow will dominate the landscape. Last, the shadows can best be caught on long camera exposures. In this picture taken in Port Campbell National Park, Victoria, Australia, seven 15-second images of the ground and de-rotated sky were digitally added to bring up the needed light and detail. In the foreground lies Loch Ard Gorge, named after a ship that tragically ran aground in 1878. The two rocks pictured are the remnants of a collapsed arch and are named Tom and Eva after the only two people who survived that Loch Ard ship wreck. A close inspection of the water just before the rocks will show reflections and shadows in light thrown by our Milky Way galaxy. How did this big rock end up on this strange terrain? One of the more unusual places here on Earth occurs inside Death Valley, California, USA. There a dried lakebed named Racetrack Playa exists that is almost perfectly flat, with the odd exception of some very large stones. Now the flatness and texture of large playa like Racetrack are fascinating but not scientifically puzzling - they are caused by mud flowing, drying, and cracking after a heavy rain. 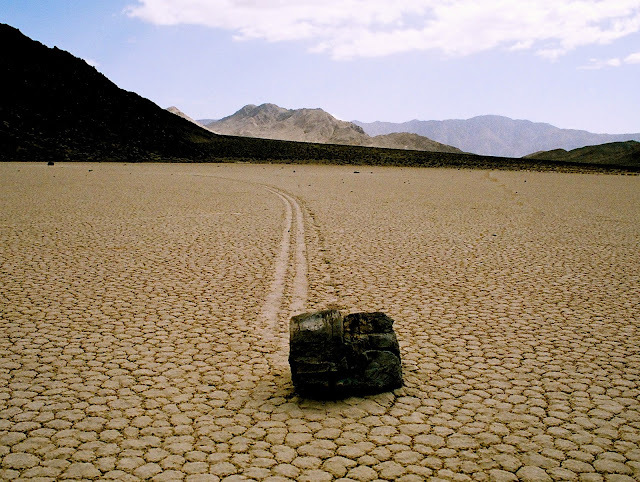 Only recently, however, has a viable scientific hypothesis been given to explain how 300-kilogram sailing stones ended up near the middle of such a large flat surface. Unfortunately, as frequently happens in science, a seemingly surreal problem ends up having a relatively mundane solution. It turns out that high winds after a rain can push even heavy rocks across a temporarily slick lakebed. Have you ever watched a lightning storm in awe? Join the crowd. Oddly, nobody knows exactly how lightning is produced. What is known is that charges slowly separate in some clouds causing rapid electrical discharges (lightning), but how electrical charges get separated in clouds remains a topic of much research. Lightning usually takes a jagged course, rapidly heating a thin column of air to about three times the surface temperature of the Sun. The resulting shock wave starts supersonically and decays into the loud sound known as thunder. Lightning bolts are common in clouds during rainstorms, and on average 6,000 lightning bolts occur between clouds and the Earth every minute. 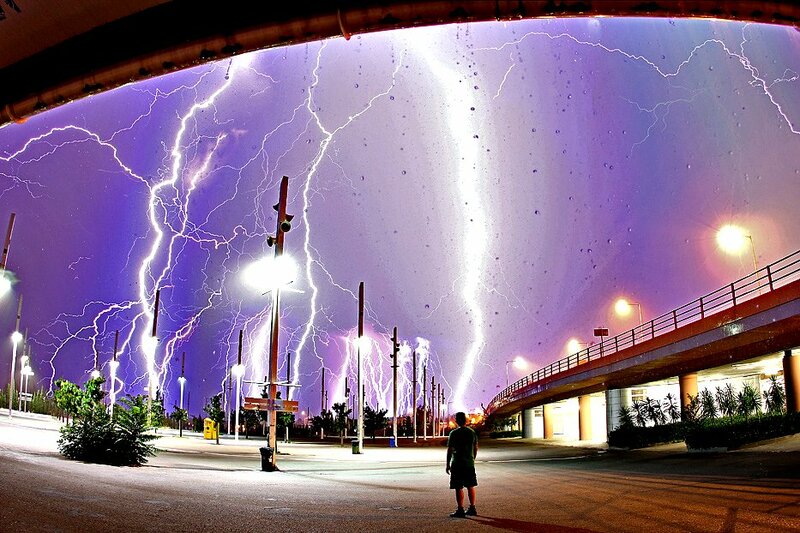 This, an active lightning storm was recorded over Athens, Greece earlier July 2010. 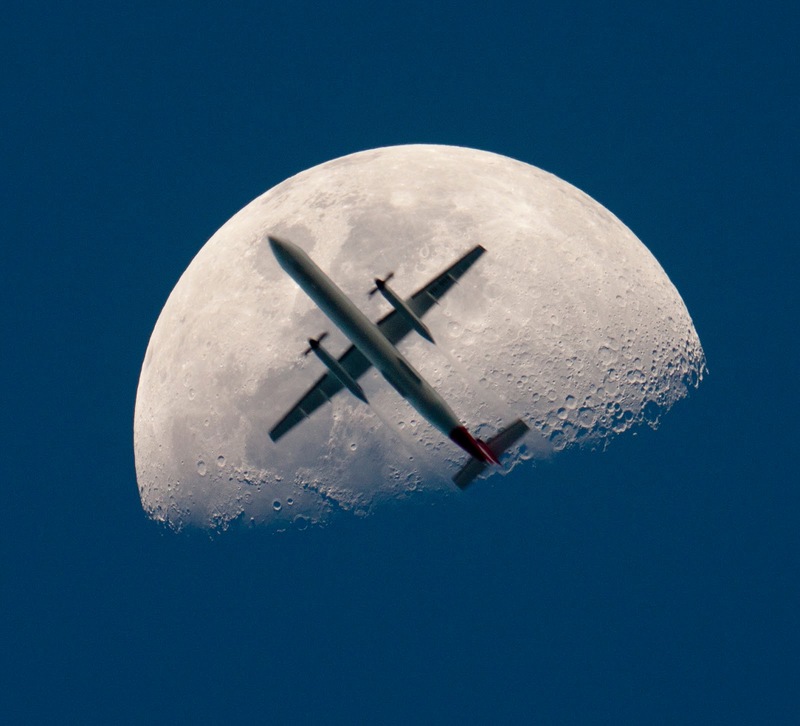 If you look closely at the Moon, you will see a large airplane in front of it. Well, not always. OK, hardly ever. But if you wait for days with your camera attached to a Moon tracker in a place where airplanesare known to pass, you might catch a good photograph of it. Well, if you're lucky. OK, extremely lucky. This image was taken in September 2010 over South East Queensland, Australia using an exposure time of 1/250th of a second and, in the words of the photographer, "a nerve of steel". It is a 50-light-year-wide view of the central region of the Carina Nebula where a maelstrom of star birth - and death - is taking place. The hurricane blast of stellar winds and blistering ultraviolet radiation within the cavity is now compressing the surrounding walls of cold hydrogen. This is triggering a second stage of new star formation. Our Sun and our solar system may have been born inside such a cosmic crucible 4.6 billion years ago. In looking at the Carina Nebula we are seeing the genesis of star making as it commonly occurs along the dense spiral arms of a galaxy. The immense nebula is an estimated 7,500 light-years away in the southern constellation Carina the Keel (of the old southern constellation Argo Navis, the ship of Jason and the Argonauts, from Greek mythology). This image is a mosaic of the Carina Nebula assembled from 48 frames taken with Hubble Space Telescope's Advanced Camera for Surveys. The Hubble images were taken in the light of neutral hydrogen. Color information was added with data taken at the Cerro Tololo Inter-American Observatory in Chile. Red corresponds to sulfur, green to hydrogen, and blue to oxygen emission.